The gospel text for the day was Mark 16:1-20 or the ending of the gospel. The non-scripture reading that was paired with it just bowled me over to the point that you wonder if it was just another “preacher story” – truthfully I would hope that it was a pious fiction, but sorrowfully knowing that it was real because our fiction doesn’t imagine stuff like this. I’m probably breaking 50 copyright laws (although the readership is not so great that even on the internet it might be considered private use 🙂 ), but I’m just going to type it out. In the Nuremburg war-crime trials a witnes appeared who had lived for a time in a grave in a Jewish grave-yard in Wilna, Poland. It was the only place he – and may others – could live, when in hiding after they had escaped the gas chamber. During this time he wrote poetry, and one of the poems was a description of a birth. In a grave nearby a young woman gave birth to a boy. The eighty-year old gravedigger, wrapped in a linen shroud, assisted. When the new-born child uttered his first cry, the old man prayed: ‘Great God, has Thou finally sent the Messiah to us? For who else than the Messiah Himself can be born in a grave?’ But after three days the poet saw the child sucking his mother’s tears because she had no milk for him…When I first read it, it occured to me more forcefully than ever before that our Christian symbols, taken from the gospel stories, have lost a great deal of their power…it has been forgotten that the manger of Christmas was the expression of utter poverty and distress before it became the place where the angels appeared and to which the star pointed. And it has been forgotten that the tomb of Jesus was the end of His life and His work before it became the place of His final triumph. We have become insensitive to the infinite tension which is implied in the words of the Apostle’s Creed: ‘suffered…was crucified, dead and buried…rose again from the dead.’ We already know, when we hear the first words, what the ending will be: ‘rose again;’ and for many people it is no more than the inevitable ‘happy ending.’ The old Jewish gravedigger knew better. For him the immeasurable tension implicit in the expectation of the Messiah was a reality, appearing in the infinite contrast between the things he saw and the hope he maintained. People have long looked at the second grouping of these verses (Mark 9:42-50) as simply an individual warning. That reading has always caused me trouble as I either needed to treat it as completely spiritual which I don’t like, or I needed to go lopp off a hand or pluck out an eye, which I liked even less. 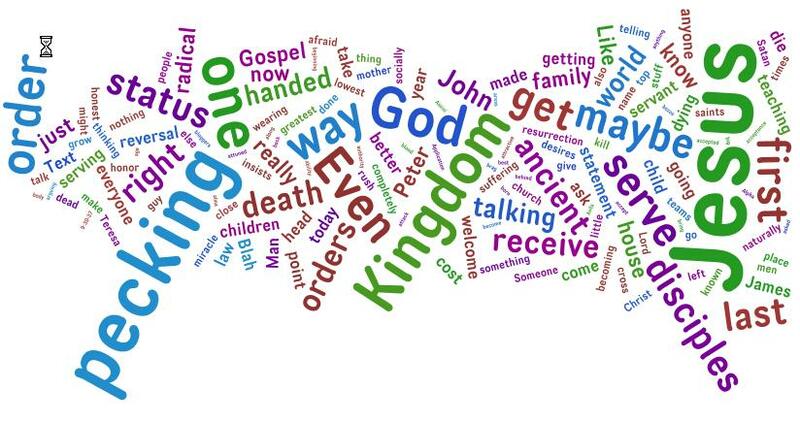 The context of the entire segment continues from the last couple of weeks lectionary readings (Mark 9:14-37), and that is more teaching through actions to the disciples how the church (the reign of God) will function. Speaking of the church in bodily terms is not exactly unbiblical either. The first grouping of verses is clearly about how we treat those of Christ who are not of our group. This is not directed at heretics, but those who are doing good stuff (i.e. miracles! in the text) in the name of Jesus. We treat them well – maybe not join them, but definitely don’t stop them. That is the low walls portion. The church welcomes all who come in the name of Christ. This gets balanced by that second group. If someone within your tribe is causing people to lose faith – it is not good for them or the group, cut them out. This is the high standards portion and it calls for judgement. Does the crank in every congregation or synod – you know the one that is always harping on [pick the subject they don’t agree with church teaching on] – does that guy or gal cause anyone to stumble? Probably not. Does an Elder of the congregation who denies infant baptism, or a preacher who ‘sleeps around’ or worse? Probably so. Its a tricky thing to pull off in a fallen world, but that seems to be the call of the church. Low walls – welcome everyone who claims the name of Jesus. High Standards – the church stands for something. If someone disagrees and it causes people to lose faith they must be called to account or cut off. The church in that way is about reconciliation and absolution. We admit where we are wrong, but we also receive that forgiveness. 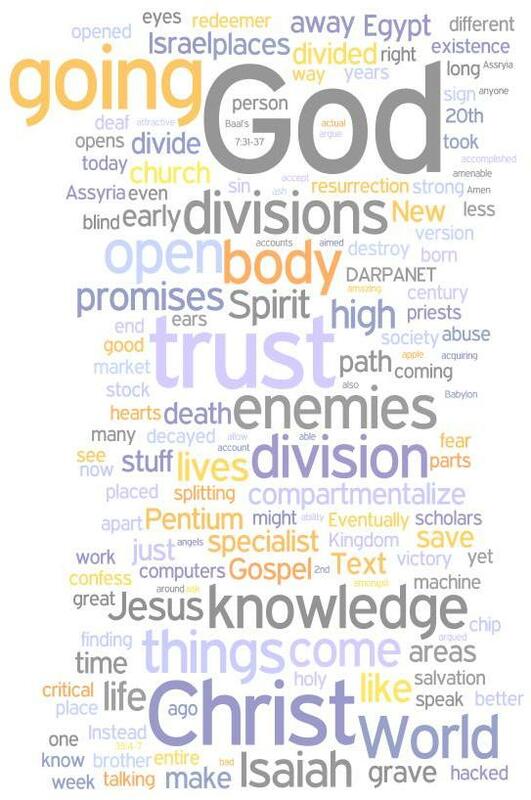 Being a little meta about this sermon – it is a tough subject. I was really afraid that this was a non-stop bore fest. It interested me and I think it is important, but not really a ‘felt need’ type of thing. It is a real need – we need to be in a church as that is where we find salvation. But the jump from felt needs to real needs is not always obvious and this tended to be very intellectual which is a code word for boring. William Willimon is a great preacher. And somewhere along the way he decided to give up a cushy job as the Dean of the Chapel at Duke and become the presiding bishop of North Alabama Conference in the UMC. That is roughly like giving up a job that has no accountability where people praise you all day and you get plenty of time to fly around, give a talk and hear more people praise you to take a job where you get all the responsibility with little power and have to deal with all the crap that an institutional church throws up the ladder and hear people complain about stuff all day. In short, this guy is putting his life where his words have been at. Every now and then he throws up a blog post here (roughly weekly, but with some longer stretches). This particular post seems important. Dr. Willimon is in the midst of making a argument that the church of the very near future (i.e. the day after tomorrow) better be fundamentally one concerned about Theology. In building or re-building churches there are a lot of techniques and a bunch of ways to talk about them. There is even an entire “movement” dedicated to these techniques called appropriately “the church growth movement”. Most of what is in that movement is nothing more than applying to the church the best practices of institutions in the world. Now the church is supposed to be different – it is not only an institution of this world – but can you really complain about things that boil down to “if its important measure it, track it and hold people responsible”? The problem is that a church reduced to what it measures and tracks is a church without the gospel. It is also one without disciples. You can be a member of such a group. That place might claim to sell all kinds of things with that membership. [Joel Osteen promises you – your best you now!] But that mentality of buying and selling or of being a member is really anathema to the message of the church. The church has a message – Jesus Christ is the Way, the Truth and the Life. The church is not selling that message – it is proclaiming it – this is real, believe it, come and see, follow me! Members get charged at the door. The church gives away its proclamation. It does not have any secret wisdom that it is hiding for those who buy the premium package. But what the church wants is tougher. It wants disciples. It wants people who will change their lives in accordance with what Jesus taught. Members receive fair product in this world for their dues. Disciples are guaranteed nothing in this world, but are formed for the next. In a membership metality, the disciple looks like an idiot. The Church is in that sense to be that gathering of fools for Christ. The big question is how do we as a church that is re-building make disciples and not settle for members? How do we remain true to the vision points shared earlier for St. Mark – teaching the apostolic faith, encouraging growth and depth in the faith? Are we currently memebers or disciples? Skipping the longer confessional, after looking at the text, my reaction was ‘ok, I better be careful given my anti-authoritarian nature.’ What this text asks of us thought is a radical realization followed by radical action. That realization is that we are nothing before God. Only Jesus has the authority to forgive and raise. Any like authority is completely derivative from Jesus. On God’s pecking order we don’t make the list. The action is living out that realization. This does not level authority in the worldly realm (i.e. governments are still valid, city zoning is valid) but it does call on Christians to recognize those not on the world’s pecking orders as people under God’s care to whom the gospel needs to be brought. The bum and the executive have exactly the same merit on God’s list and as far as we are Kingdom people the executive has a call to recognize that and act on that. Is that practical? No. Is that part of the Kingdom inaugurated by Jesus and which weare waiting for it complete revelation? Yes. Theology of the Cross in the Oddest Places? I have never found the theodicy argument against faith convincing. My own faith teaches me that suffering is part of a fallen creation that lives and dies – how could it not be? But it also teaches me that suffering in itself can be a means of letting go to God, of allowing Him to take over, of recognizing one’s own mortality and limits. That to me is not some kind of crutch. It is simply the paradox of the cross. My notion of a fallen world is related to the fact of mortality, which embraces almost everything on our planet, and causes terrible suffering to animals as well as humans. The difference is that, so far as we know, only humans experience this suffering as a form of alienation; we feel somehow as if we belong elsewhere, as if this mortal coil is not something we simply accept, as if our home was from somewhere else…That’s why I do not experience faith as some kind of rational choice or as some kind of irrational leap. I experience it merely as a condition of being human. The man has a firm grasp of what Lutherans would call living under the law and the need for the gospel. But maybe it shouldn’t be so surprising. Said in the best of ways – “only the sick need a doctor.” Would that God would send His church a crop of ministers with that deep understanding and turn my own heart toward that cross. Jesus will issue the disciples commands like watch! or like love one another. He will also tell us to forget things – like God forgetting our sins. There are only two things that Jesus says remember. We hear the one every communion Sunday – Do this (bread and wine, body & blood) in remembrance of me. This text is the other one – what this woman did will be told in memory of her. What did this woman do? She broke the alabaster jar. She poured everything out without saving a drop. She did it all for Jesus sake. What did Jesus do that we remember in the Lord’s Supper. He poured out his very life blood for our sake. What we do for ourselves lasts as long as we have the strength to keep it there. Even what we do for others, while seemingly good, will not be remembered. Only what is done in Christ is remembered. Only the one that loses their life will find it. For ultimately isn’t that what life is – being remembered by God? The turn to fall, the fig and the command to Watch! A quick note – I’ve been a slacker about writing most of this summer. It has been a summer full – full of joys and of sorrows. I intend to get back to a 3 – 4 day a week cycle God willing. Maybe it is a psychological thing, my good daughter Anna has returned to school and candy corn is appearing in the store aisles, but today felt like autumn. The sun felt that much less intense on the forearm. The air felt crisper than the summer fullness. We pick up those signs. The longer we live on this earth, if we are perceptive, the more we just know what is coming. Jesus is telling the disciples something that they will know and something that they won’t in the gospel reading for today. The first part most scholars think is talking about 70AD, the distruction of Jerusalem. Jesus is telling them to be observant, learn from the fig, you can tell when the seasons are changing, so when you see these things the end of the temple is near. While that will seem like the end of the world, it won’t be. That time, when Heaven and Earth will really pass away, you won’t know. You know what? The command is still watch. We watch and we can discern when an older order of things is passing away, when the temples of the world are being judged and torn down – a small letter day of the Lord. That watching is preparation for the capital letter Day of the Lord so that we might be found awake and faithful on that great and glorious day. The arresting line in the gospel text (Mark 9:14-29) is of course – ‘I Believe, Help my unbelief!” But, the point of the text by its own words are prayer – “this kind only comes out with prayer.” What comes out? A demon of muteness and deafness. If faith comes by hearing, and if those who have believed in Mark’s gospel respond by telling everyone even over Jesus’ commands – is there not a better description of unbelief than one who is deaf to the Gospel and mute at its reception? Help my unbelief was the father’s cry. The disciples said as much when they asked – “why couldn’t we drive it out?” Jesus answer is get connected. Renew and strengthen your faith through prayer. 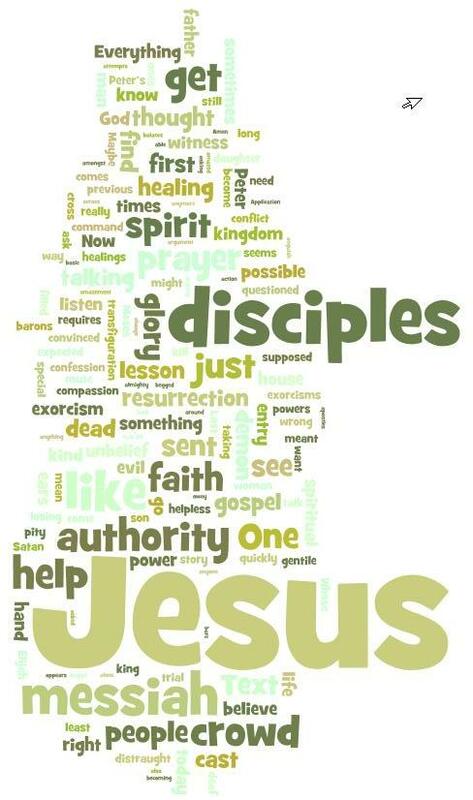 I concentrated on the disciples as learners (the core meaning of the word). Rev. David Bernard (VP of the Eastern District) shared a different view that captured my attention today. The father says “I believe, help my unbelief” after the disciples are unable to cast out the demon. 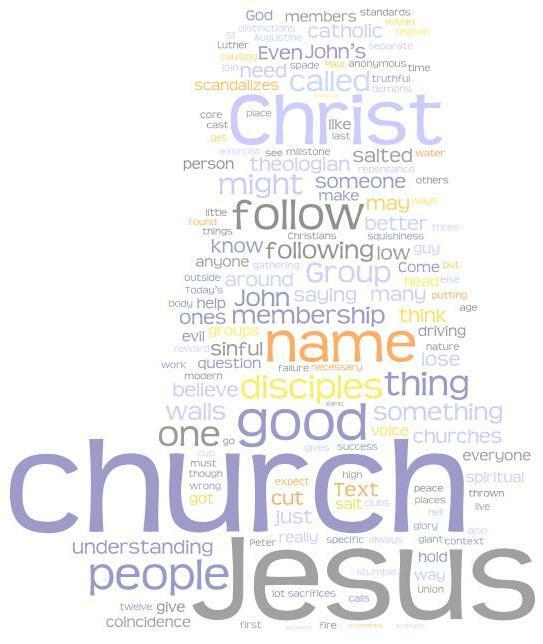 If you look at the disciples as either the church or the ministerium (they are the proto-church and also the proto-ministers and sorting out when they are what is often subtle), that phrase takes on a very potent modern view – “I believe in you Jesus, but your church/ministers sure brings out my unbelief.” In an day when entire church bodies vote to ignore the Word of God as authoritative (see the post below on the ELCAs recent statement on sexuality), the church can get in the way of faith and even encourage faithlessness. This is the internet so we can post drafts of things that we can alter later, right? Here is a draft which I’ve sent out for some review on a teaching response to the actions by the ELCA and the EC-USA this summer. I say teaching response because while I think many people would be able to tell you that the LC-MS and the ELCA do not agree on Human Sexuality issues, I also think that many would not be able to tell you why they disagree other than just plain orneriness. This response attempts to fairly review ELCAs arguments and to also provide the basis for the LC-MS position. Even for someone who would rather ignore denominational and church politics, this summer in the United States saw two major church bodies take hard votes on issues of sexuality. The Episcopal Church, much smaller in numbers today but long the church of the old WASP elite with cultural significance much larger than numbers, and the other body carrying the Lutheran name, the ELCA, both voted to recognize homosexual clergy and monogamous homosexual relationships. Those votes by those church bodies to adopt policies that are in opposition to historic Christian teaching are tough to ignore. What I intend to do in this note is to fairly and clearly portray the action taken and also to state the Lutheran Church – Missouri Synod’s teaching on the same maters.